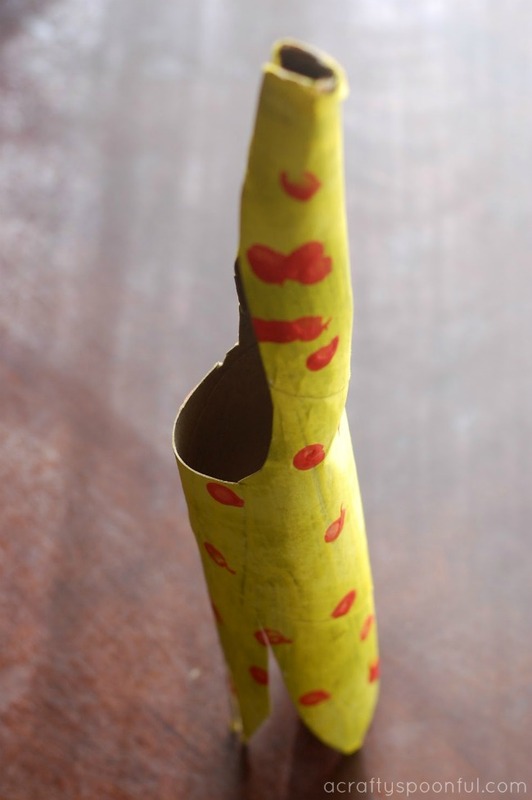 When life gives you toilet paper rolls, make a cardboard giraffe! This simple tutorial shares how you can make your own DIY cardboard giraffe using only a few supplies. Since I started incorporating Tot School lessons into our weekly schedule I’ve been on the hunt for more and more fun crafts for my kids. 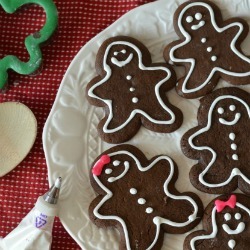 I’ve been using Pinterest to keep track of what crafts to make and love being able to choose crafts that pair well with the week’s theme. 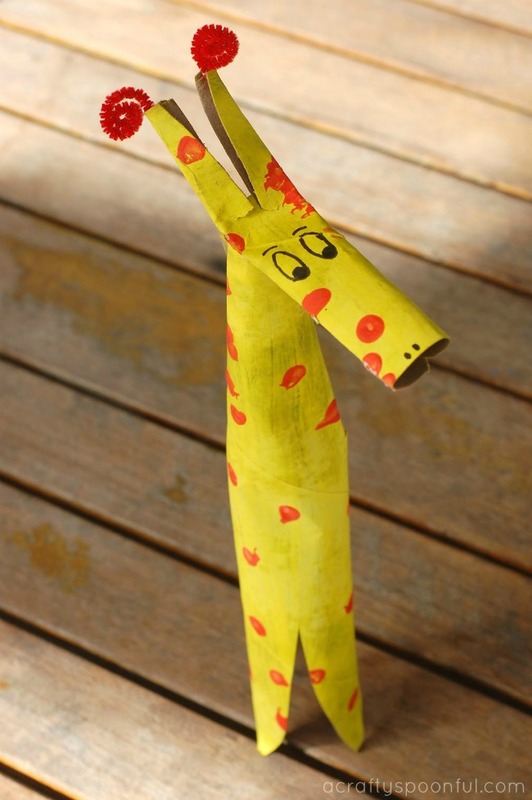 This week we learned about mammals so I thought this adorable cardboard giraffe would be the perfect craft to make. My three year old LOVES to paint so whenever I ask him if he wants to do a craft where painting is involved he quickly agrees. I love that this craft not only includes a paint brush to paint but also q-tips to make circles on the cardboard. My son has never used q-tips in his painting and I think this is one fun tool we’ll start incorporating more often! We also used the circles as a counting tool as well. we were able to count each circle we made after we assembled the giraffe. We also got a lot of fun imaginative play out of this craft turned toy. 1. 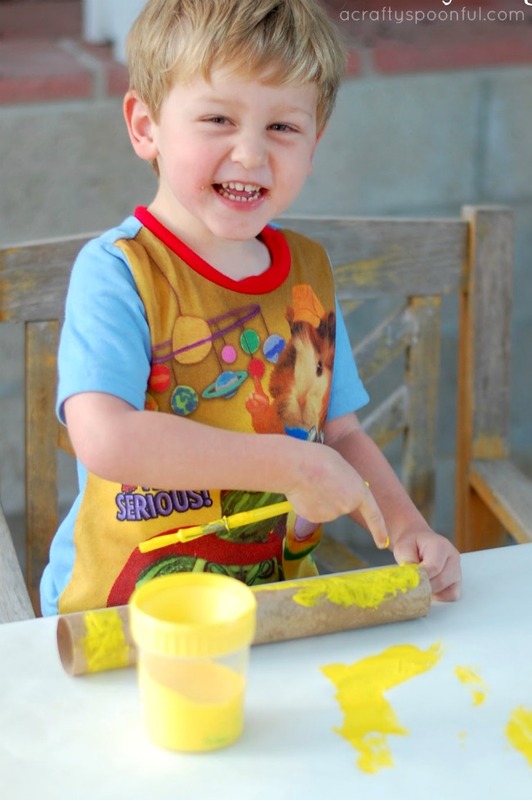 Have your child paint the cardboard tube with the yellow paint. Make sure it’s completely coated. Let dry. 2. Once the yellow paint has dried grab the orange paint and some q-tips. 3. 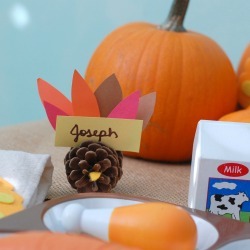 Let your child dip the q-tips into the paint and start to dot the yellow cardboard. Don’t be alarmed if they start drawing lines instead of dotting. It’s all fun! 4. Let the orange dots dry. Once the paint is dried cut out four lines on one side of the cardboard. Then shape those four sections into the giraffe’s legs. 5. On the opposite side cut out a large U. The leftover portion of this side of the cardboard will be the neck of the giraffe. 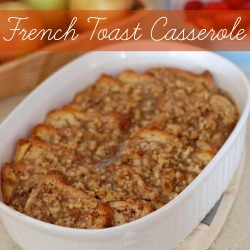 Take each open side and curl them into one another. Glue or tape closed. 6. Take the leftover cardboard from the U and roll it into a cylinder. 7. Glue or tape the cylinder closed. Flatten the cylinder and cut a V into one side. 8. 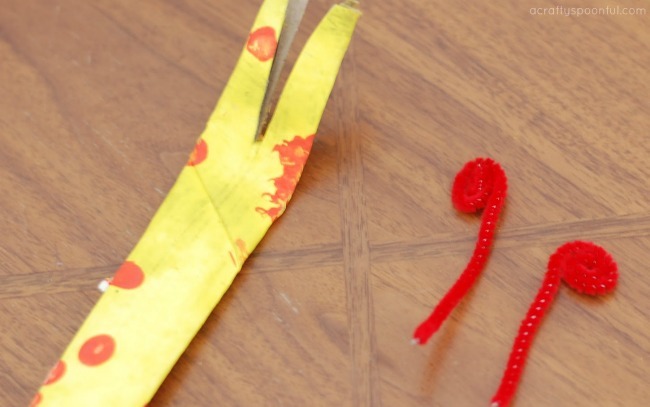 Take the pipe cleaners and roll up one side to create the horns of the giraffe. Slide the horns into the cardboard slots and close with glue or tape. Let dry if glued. Bend cylinder at the base of the horns to get them to stick up. 9. 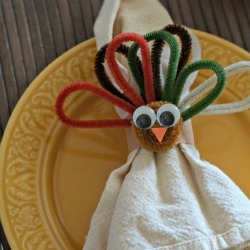 Attach the head and horns onto the neck with tape or a stapler. 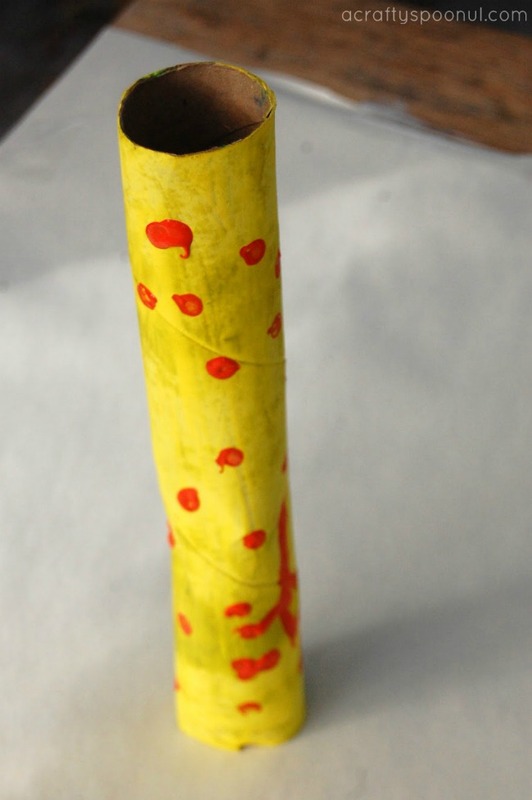 Draw eyes and nose slits on the cylinder to personalize your giraffe. 10. 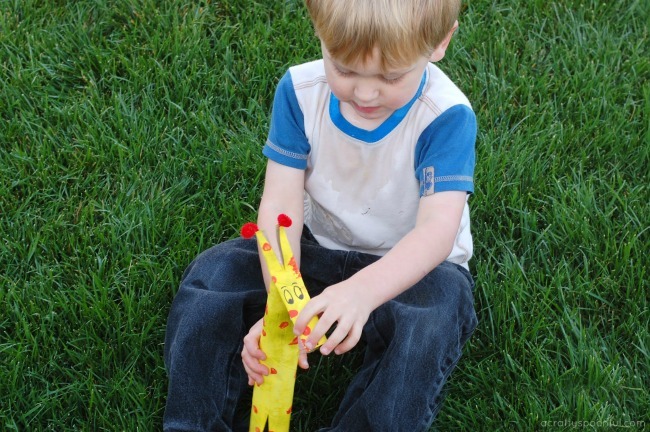 Give your giraffe a name (or allow your child to name it) and start playing. Have fun! 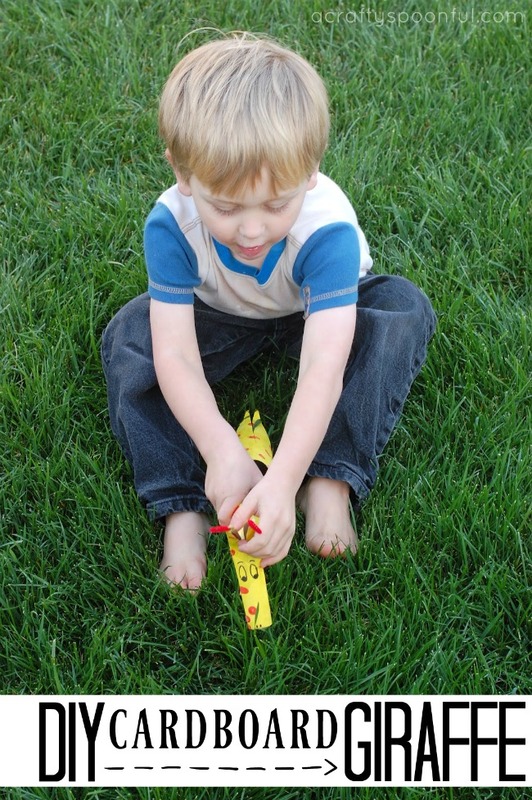 The first thing my son did when we finished his giraffe was to take it out to play in the grass. The giraffe loved eating all of the grass he offered it. If you make your own DIY cardboard giraffe, please make sure to share a photo with us on our Facebook page! Have you made any cardboard animals? Which is your favorite? As it nears closer and closer to my daughter’s first birthday (how did that happen!?) I’ve began to think about what top ten items she would love to receive from us as well as suggestions for friends and family members who want to give her something. Some of the items I’ve thought of are items we’ve already used and love with our son and others are new items we’ve played with or used at friends houses and play places. 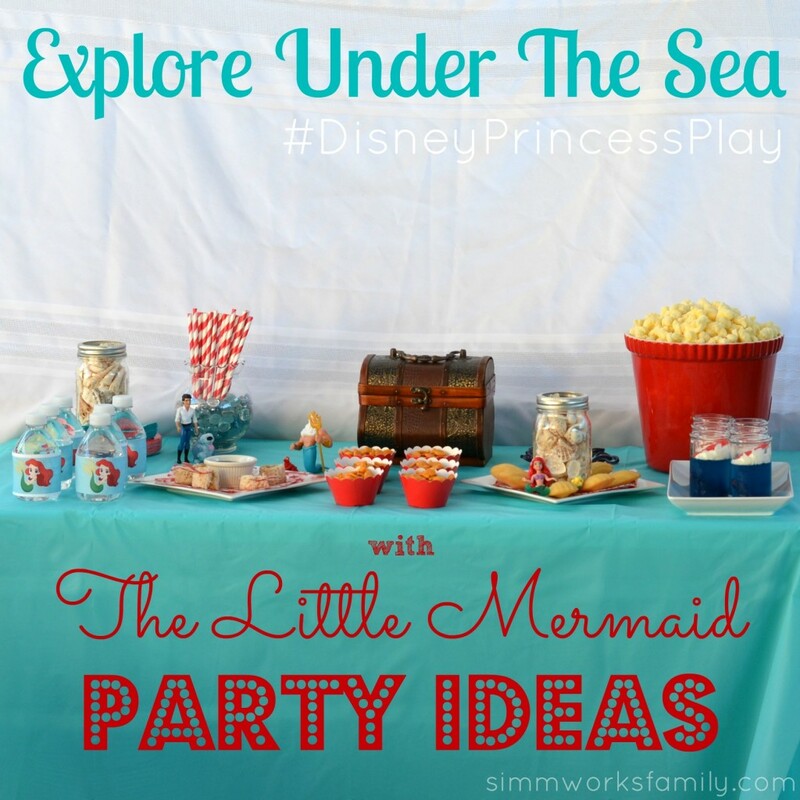 Do you have any other suggestions to entertain a 1 year old? You know, besides cardboard boxes and pots (and the given money for her college education)? I’d love to hear them! I’ve included pinks and purples in with the blues and greens because honestly, my kids don’t care about the colors yet, just about the toy and playing with it. My son plays with dolls and my daughter plays with trucks. And I’m cool with that. 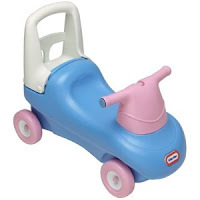 We played with this push toy at our last visit to Kidding Around and Miss M just loved it! She sat on it and let me push her around. And the whole time she was on it she was grinning from ear to ear. When I stopped pushing her long enough to take a picture she started crying. That was immediately resolved by pushing her around again. And after we were done with riding on it she used it to “walk” around a bit. Win-win because it serves two purposes. My daughter is already in love with drums. She constantly steals her brother’s drum and drum stick and beats just about everything she can find on in (including poor Sophie the Giraffe). So when I saw this music set from one of my favorite toy brands, B. Toys, I knew that it would be a perfect fit for our home. And while we haven’t used it yet I’ve heard rave reviews from many friends about the instruments included and the durability of the product. Now this is a toy that my son received for his first birthday by our dear friend Alanna. And he still plays with it. He’s almost three! 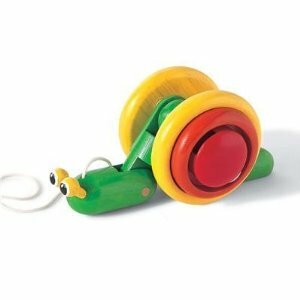 He was able to play with this toy as he crawled around on the ground, when he started to toddle and now he runs through the house with the snail behind him. I’ve never seen a snail run so fast! This snail has taken quite a few beatings over the years but still looks as new as the day we took it out of the box. Miss M is having quite a fun time chasing after the snail, and her brother. And I love Plan Toys. 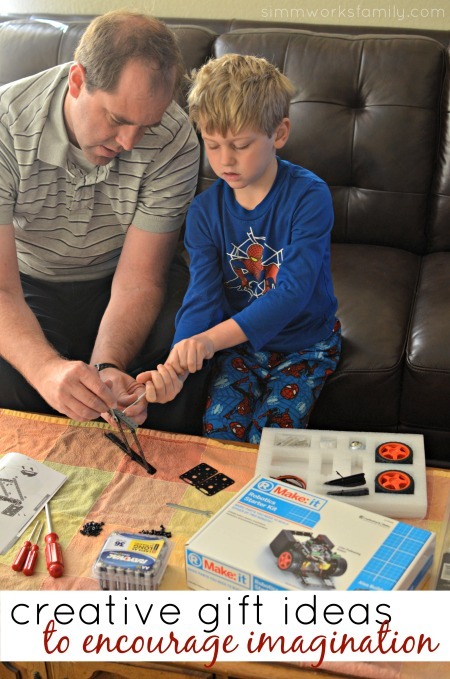 They are an awesome toy company that use green materials and green manufacturing. They not only make quality toys, they are a quality company I love to support. 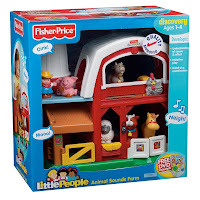 Every little kid needs a Little People farm. Seriously. They’re awesome. 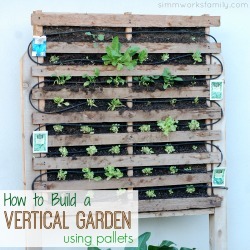 I find myself gravitating to our farm every time I go into my son’s bedroom to play. And Miss M loves playing with her brother’s animals and farm. She even puts the animals in and out of the barn. There’s also a tractor that goes greatly with this farm. The farmer gets to ride around in the tractor and a little piggy pops out of the hay bale in the back. M laughs every time she sees it! My son asked for his first doll at about 18 months so we purchased one at the mall we were at and didn’t really put much thought into what doll we bought. We have three baby dolls now but whenever my daughter tries to play with them (or gnaw on them) her brother quickly takes them away. So I know I need to get a doll just for her. This Baby Stella doll is perfect. Soft, small and cute, just like her! And I’m considering getting a boy doll for my son so he can play with her. We got this awesome Activity Cube for my son’s first birthday. He and his friends still play with it to this day. This cube is a great investment. It is a great toy from kids ages 6 months to 3+ years. And even though I can’t find our exact cube for sale anymore I still have seen great reviews for it. And there are plenty of activity cubes out there to choose from. While this isn’t technically a toy we really love our faucet covers. 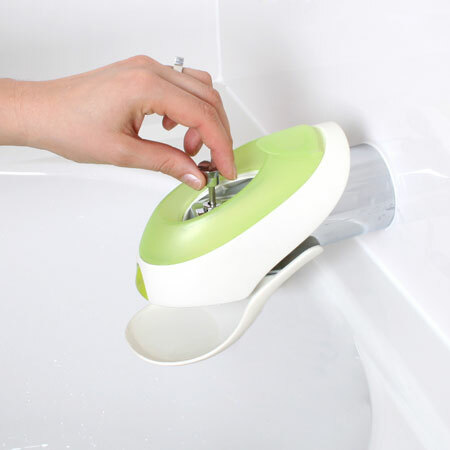 When our kids started getting more mobile in the bath tub we knew we needed to protect their little noggins from hitting the bath faucet. And we wanted to make bathtime fun. So we got a super cool Crayola octopus bath faucet cover and were gifted an equally cool Boon Flo cover. And toys to go in the bath as well as something to scoop up the toys (like this awesome Boon frog) are also great gifts for a 1 year old. 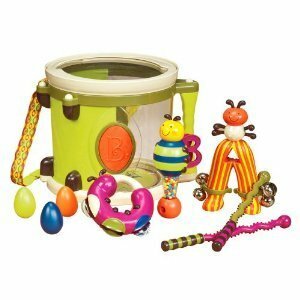 I know my son loves playing with his Discovery Toys stacking cups and his Fisher Price Amazing Animals™ Tubtime Tugboat™ the most. Baths stop being about getting clean and start being about having fun in the water! My kids love balls. They love to throw them, attempt to eat them and bounce them. We have them all over the house. But the best ones I’ve found for one year olds are the ones they can get a grip on. 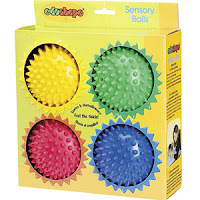 We found a large pack of sensory balls at Costco last Christmas and they have held up very well. Half are in the house and half are in the front yard. What kid doesn’t like to play with balls? 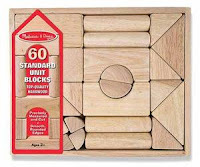 We have many different sets of blocks for the kids to play with. From soft, cloth blocks to squishy, squeaky blocks to wooden blocks. 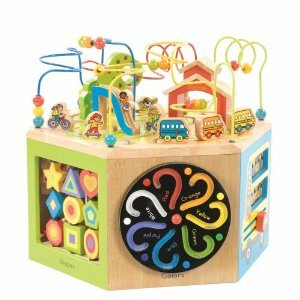 Each different set helps teach the kids to stack, line up and make fun structures. 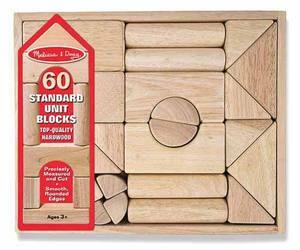 Every kid needs a good set of blocks to play with. And the best part about these sets is that they don’t just last for a small period of time, most of the block sets we own will be used for a few years. Especially the wooden one. That’s a favorite of my son’s right now (thanks Aunt Miranda for buying them!). Every kid needs their own sized chair. Whether it be the Anywhere Chair or one similar, smaller, child-size chairs always seem to attract kids of all ages. My son loves to grab a book and pretend to read in his chair. He also likes to watch movies while sitting in it. When he was 18 months old I remember that he grabbed his chair, dragged it into the living room and pushed it into place between mine and my husbands chairs. It was so adorable! He wanted to be just like us. So we know we’ll have to get our daughter one of her own for Christmas this year. It just makes sense! This is not a sponsored post. I either own and have used the toys with my own children, or have heard great reviews from reliable friends and family. I was not compensated by any of the companies listed above. The opinions stated are my own.